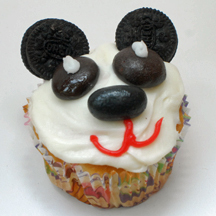 Make a panda bear cupcake quickly and easily with candies and frosting. Remember, if you don’t have the types of candy described on hand, substitute something else! They’ll still be cute. What You Need: 1 cupcake; white frosting; 2 mini Oreo cookies; 2 Junior Mints; 1 black jellybean; red and white writing icing or gel. How to Make It: Frost cupcake generously, so the Oreos will have a base in which to stick upright. Add 2 Oreo cookies for ears. Add Junior Mint eyes and pipe white dot in center. Add jellybean nose and pipe mouth beneath it as shown. This entry was posted on Saturday, July 26th, 2008 at 11:57 pm	and is filed under animal cupcakes. You can follow any responses to this entry through the RSS 2.0 feed. Responses are currently closed, but you can trackback from your own site.